Most veterans of the “weight loss wars” know that it’s not just about losing weight….but more particularly….losing FAT. Did you know there’s a difference in the types of body fat. 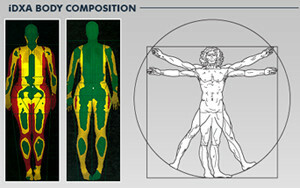 The iDXA body composition scan is the most accurate measure of body fat available. We use this test to help you improve your health, and optimize your training and nutritional plans. This machine is used by scientists, physicians, and sports performance labs around the world. While amazingly accurate, its accuracy is not the only reason for iDXA’s adoption by professionals as the gold standard. The iDXA machine is renowned for being about to discover exactly how much of your body mass is made up of fat and where that fat is stored. It provides the complete picture of your body composition (including lean mass, fat mass, and bone mass). This information empowers you to avoid many of the diseases plaguing so many in today’s society. Android fat, is the leading cause of ‘Buddha bellies’ and popped pant buttons. This is the fat stored in the midsection of the body: predominantly in the abdomen or android region, but also the fat stored in the chest and upper arms also known as the trunk. Men commonly store their fat in these regions. People with the “apple shape” are more likely to have health issues such as increased risk of heart disease, diabetes, hormonal imbalances, some cancers, sleep apnea, and more. Visceral fat stored in your android and trunk regions is extremely dangerous. What is visceral fat you might ask? Subcutaneous fat: This is the noticeable layer of fat just below your skin that jiggles, dimples, causes cellulite, and is the preferred fat of liposuction hoses. Visceral fat: Found deeper inside our abs and surround our organs like the liver, pancreas, and intestines. Visceral fat is linked to all those diseases listed above. Another major issue with visceral fat is related to the release of proteins and hormones that promotes inflammation in our bodies, which in turn creates havoc in our metabolism and causes Cortisol production. Cortisol, being a corticosteroid, promotes fat storage and insulin resistance…causing this poisonous cycle to start all over again! On the positive side of things, when you lose visceral fat, your abdominal cavity contracts; giving you a narrower waistline and a flatter belly. This has a positive domino effect that can reduce LDL cholesterol, pesky triglycerides and improve insulin sensitivity! Gynoid fat storage (i.e. 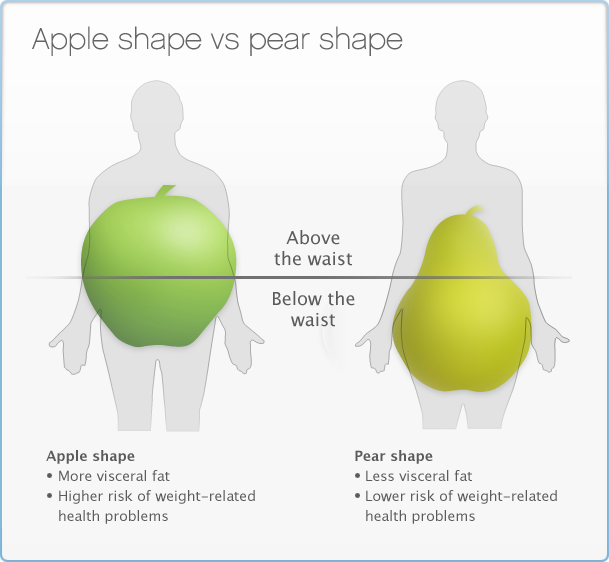 the “pear shape”) is more common among women. This fat is stored primarily around the hips and thighs, and its storage is considered healthier—although some men with gynoid shapes may have hormonal imbalances. Overweight pear-shaped people tend to suffer from mechanical problems such as hip, knee and other joint issues due to an excess of fat (weight stress) on the lower half of their body. There is also a third type of body shape, the Ovoid. It’s less known by folks, and there is no differentiation between men and women. Its fat storage promotes an ‘egg shape’ and means general fat coverage. Too much fat anywhere is not good, so knowing your body’s distribution is critical to monitoring your health risks and avoiding disease later in life. Since a iDXA scan directly measures the different types of fat stored in every region of your body, we will know how to take action that to help you lose fat, and reduce your risk for disease. And remember, this body type is a result of organs insulating themselves from toxins by encapsulating the toxins in fat. Ironically, it’s a survival strategy that may impede organ function and ultimately increase your risk for disease. Ideally your android fat should always be lower than your gynoid fat. Men with the ovoid shape may be carrying more than the ‘usual’ amount of fat on the hips, thus making them appear OK using the waist-hip ratio; yet they may be carrying more than a healthy amount of fat on the abdomen. An iDXA scan eliminates this chance for error by directly measuring your trunk, android and gynoid fat percentages. This way, it’s easy for you and your doctor to evaluate your risk for health problems associated with your particular build and location of stored fat. The factors that influence fat distribution are partially controllable by you, and even the genetic factors can be mitigated to some extent. It’s important to remember that fat distribution is influenced by hormones, genetics, race, presence of toxins, physical activity (type and amount), malnutrition and stress. Of these factors, you have complete control over the last four: toxins, physical activity, nutrition and stress management. If you possess the relevant information; if you know where you want to go and if you understand how to get there, the only problem which remains is one of execution. So the pressing question is: where can we get THE BEST and most complete information and then how can we translate that information into a plan that will yield the best results? As we transform our bodies, we must know where we started (as a baseline) and how well the transformation is going…in real time. Time is the scarcest of all resources; don’t waste it by failing to assess if your program actually delivers the results you want! 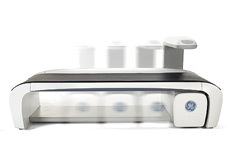 A Prolean Wellness iDXA scan empowers you with accurate and outcome-based feedback…all in a matter of minutes. It helps you discover where you store fat, so you can use the information along with other markers to tailor training and a nutritional program that’s appropriate for your body type, physiology, and goals. If you want more help or support along your fitness path, we’re always here with a map, compass, and supplies to help you get to your destination sooner and more effectively. Now all you need to do is decide where you want to go; figure out the means to get there; and, finally, execute! Oh and one more thing while we are at it…you can work yourself to the bone and NOT see the results you’re after if you do not check out what’s happening on the inside with your metabolism. Prolean can help you there too! We have ultra-reasonable rates on lab work that can mean the difference between okay results and spectacular results! You need to cover all the bases if you are going to make the effort. Call us at (480)477-6334 and we’ll show you how.